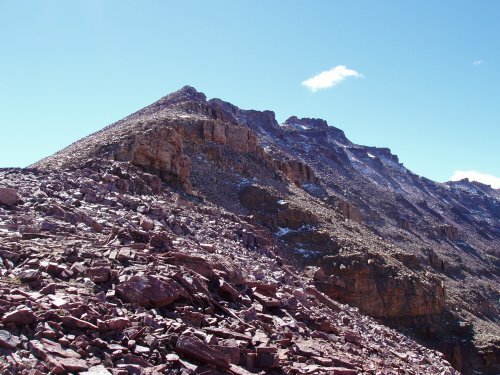 Kings Peak, at 13,528 feet above sea level, is the highest point in the state of Utah. 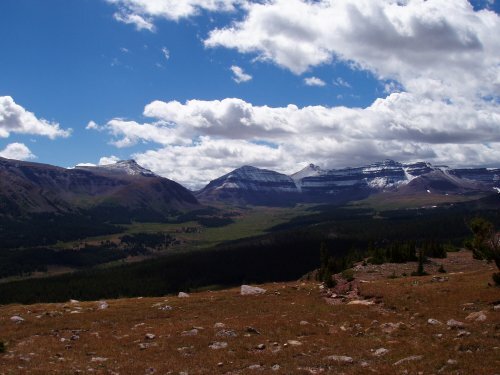 It is just south of the major ridge of the Uinta Mountains, the largest east-west mountain range in North America. The peak is one of a number of peaks which top thirteen thousand feet in the range, which is composed primarily of Precambrian quartzite. 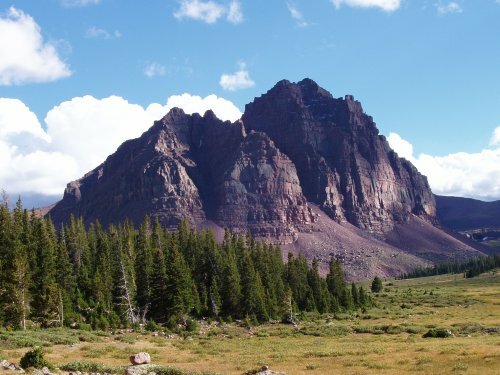 The High Uinta Wilderness Area encompasses much of these mountains, and affords excellent backpacking, fishing, and other primitive activities. During the late spring and early summer of 2004, I started doing more and more hiking around my college home of Provo, Utah, and Kings Peak made its way onto my list of mountains to climb. In early June, I determined to climb the peak, and approached a few of friends about the possibility of joining me on a 3 or 4 day backpacking trip to the summit. Several expressed interest, but in the end only one, Chris, was able to make the trip. We settled on August 24-28, a Tuesday through Saturday stretch which would give us plenty of time to approach the mountain, as well as some time to enjoy ourselves. The logistics were fairly simple; we planned on driving to the trailhead Tuesday afternoon, hiking around for a few days, and then driving back home on Saturday. We also settled on a route which was a little less common than the typical routes used to climb Kings Peak. Our route would bring us in through the China Meadows trailhead, loop over to Henry's Fork, and them back around over Anderson Pass, and past Red Castle. 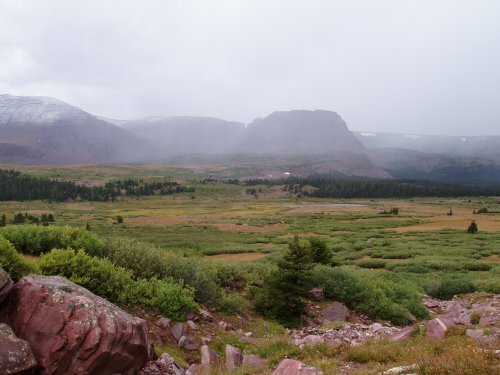 Although longer, this would allow us to see more scenery, and enjoy some different aspects of the Uinta Mountains. In getting ready for the trip, we determined the gear and supplies we would need. In determining our route, I found the book High Uinta Trails by Mel Davis and John Veranth to be very useful. For our proposed route I obtained the Bridger Lake, Mount Powell, and Kings Peak USGS 7.5' topographic quads which came in handy both prior to the trip and while we were in the Wilderness. In addition to acquiring the correct gear and guidance, I also found it helpful to make a few excursions into the local mountains of the Wasatch Range near Provo to help break in my boots, as well as get used to the climbing and altitude which we would experience. In the months leading up to our trip, I hiked both Deseret Peak, which is just above 11,000 ft., and Mount Timpanogos, elevation 11,750. Although shorter, and lower in altitude, both of these hikes featured substantially more gain in elevation from the trailhead than Kings, and they afforded me good preparation for working in high altitudes. After all the preparation and planning, I was grateful when the trip finally rolled around. After wrapping up a few loose ends at the office, I stopped by Chris's place about 3pm and we finished packing the gear. We got on the road around 4pm, and planned on being at the trailhead around 7pm. We passed though some rather ominous looking clouds on our way up to Evanston, and we were a little concerned about the weather which we might have while we were up on the trail. 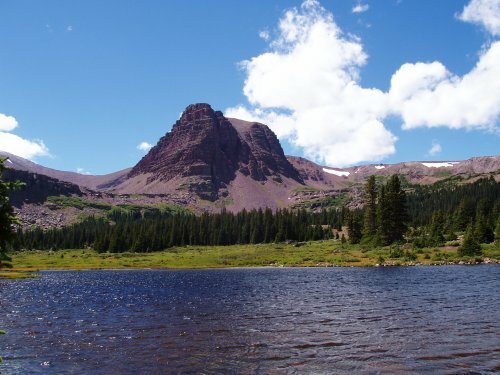 An unnamed peak over Grass Lake. The whole basin is littered with small, shallow, alpine lakes. To get to the China Meadows trailhead, we followed the directions outlined in Davis & Veranth's book, stopping to grab a quick bite to eat at a Pizza Hut in Mountain View, Wyoming. As we drove south back into Utah, rain continued on us, and we grew concerned about what kind of weather we would run into. It wasn't raining hard enough to slow our progress on the dirt Forest Service road, though, which was very well graded and passable by my passenger car. The trailhead is located at the south end of the China Meadows campground. We thought about staying there, but as the campground was full of cows, we decided to go up the trail a little ways to get away from the livestock. After paying the $2.00 trailhead parking fee, and making final checks on our gear, we finally started out around 8pm. It was getting dark quickly, and we only made it about a mile up the trail before finding a spot to camp for the night. We didn't bother to string up our gear, but just threw up the tent and retired for the night. Wednesday morning was a little bit overcast, but we managed to stay dry as we boiled our water, ate our morning oatmeal and hot chocolate, and finished breaking camp. The route for the day had us going south on the East Smith's Fork Trail until we hit the North Slope Trail, about 3 miles. From that junction, we began our loop by going east along the North Slope Trail over the back side of Flat Top Mountain. The trail climbs only gradually, gaining about a thousand feet at it's highest point. Looking south into Henry's Fork Basin. 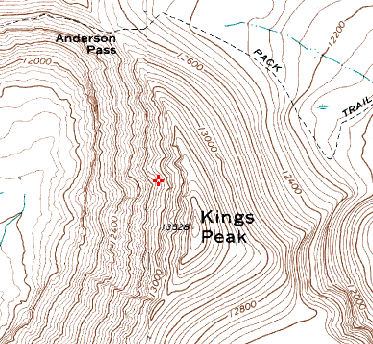 Kings Peak is the triangular point above the notch in the center, with Gunsight Pass on the left. The North Slope Trail eventually intersects the Henry's Fork Basin Trail, which descends rapidly down the side of Flat Top Mountain. The view from the rigid is tremendous, and we got our first glance of Kings Peak. There was new snow down to about 12,000 ft., which was a little disconcerting, but the weather did not look threatening, and we still had a couple of days until our summit attempt, so we weren't too worried. We had made good time thus far, and and we stopped to have lunch by Bear Lake, one of the many alpine lakes in the Basin. After eating lunch, we determined that we could go a little farther that day than we had previously planned, so we spent a couple more hours making our way south on the Henry's Fork Basin Trail. We passed several alpine lakes, on our way down to our eventual camping spot near Henry's Fork Lake. Even though it was only 2pm, we were both ready to drop our packs for the day after traveling almost 10 miles. We hadn't brought any books or games, so we spent the afternoon exploring and taking a nap or too. I had a little bit of a headache, and my knees were bothering me, so I laid down for a bit. Around 6pm, we had our standard dinner fare of freeze-dried food. I was getting a little bit queasy due to the altitude, and just barely forced down my helping; I knew I would need to energy for the next day. After stowing our trash bag in a hollowed out tree, and listening to the weather report for the night, we retired around 8pm. The weather indicated that we had a chance of showers that night, as well as high surface winds the next day. I never get as good of a rest while I'm camping as I do when I'm at home, which is one of the reasons why I like to get to bed early; I know that I'll spend at least some of the night awake. This night, it was spent from around midnight to 1:30 or so, listening to the rain on our tent fly. The intensity varied, but it was pretty constant, and at times a little too heavy for my liking. Luckily we had covered our packs the night before, so none of the gear was getting too wet, but I still worried about our chances for success for the trip if the weather continued. When we emerged from the tent, we found little pellets of snow on the ground. They weren't really flakes, but they weren't hard enough or big enough to be hail. We guessed that the "hard rain" which we had heard the night before, was probably just the snow pellets falling on our fly. We also discovered that a couple of critters had found some of the food in our packs. They seemed only interested in the nuts, however, so the rest of our food was safe. From here on out, though, we remembered to hang both our trash and our edibles from tree limbs where squirrels and such could not get to it. Looking back at Henry's Fork Basin from Gunsight Pass. There is snow falling on the far end of the Basin. As we began our hike for the day, the sky was mostly cloudy, and the air was cool. We had only gone a little way before we were out of timber line and onto the high meadow of the Henry's Fork Basin. Part of the Wilderness Act which created Wilderness Areas was the grandfathering in of grazing areas in some wildernesses. The Uintas are one such wilderness, and we saw plenty of sheep as we made our way up the Basin to Gunsight Pass. The weather was starting to get nasty, with winds blowing quite strong, and frequent snowing. The trail up and over Gunsight Pass is well maintained; it was the weather which made passing over it difficult. With my big external frame pack, I nearly got blown over a couple of times. We managed to get over the 11,888 ft pass, though, and found the trail which skirts around to Anderson Pass. We were thinking about a possible summit attempt that day, and then spending the night in the Yellowstone Basin. The trail (which isn't on the USGS maps) was a bit steep for us, but it eventually joined the main trail to Anderson Pass. We had only gone about ten or fifteen minutes on that trail when we decided it would be unwise to go any farther. Both Chris and I were pretty spent because of the weather and the hiking, and the wind was starting to get to me. We also couldn't see more than 5 minutes worth of clouds, and had no idea what kind of weather would be waiting for us on Anderson Pass. We decided to try and set up camp at a meadow around 11,600 ft., and only managed to get the tent set up before a gust came and nearly blew it right over. After evaluating our options, we decided to retreat down into Painter Basin, where we could find shelter in the trees and not be as exposed. After sitting in the tent for a couple of hours waiting for the weather to blow through, we finally emerged around 5pm to clearing skies and bleating sheep. After chatting with the sheep herder for a few minutes, we returned to our camp and made dinner. The weather report predicted clearer skies overnight, as well as only a 20 percent chance of storms the next day. Still, I thought our summit hopes were pretty minimal, and we had made plans to retreat back over Gunsight Pass if the weather wasn't perfect the next morning. Friday morning dawned bright and clear...and cold. The sky had cleared overnight, and as a result the temperature had fallen down into the 20s. There was frost on the inside of our tent, and our water bottles had frozen. Even the water we were waiting to boil started freezing over while the first pot was boiling. The sun came up rather quickly, though, and it warmed up fairly quickly. We broke camp and were on the trail by 8:30. Looking south along the Kings Peak Ridge towards Kings. The summit route involves simply scambling up the ridge. We were able to make good time back to the fork in the trail, where we decided to go for Anderson Pass. The weather was still sunny and clear, and our thinking was that we could make it to the pass, and then determine our chances for the summit that day. Our camp the night before was around 11,100 ft., Anderson Pass sits at about 12,700 ft., and although the trail is not very steep, I struggled for part of it; for most of the way up to Anderson Pass, we were setting new personal altitude records with every step. We were out of the trees almost immediately after breaking camp, and as we climbed toward the pass, even the grasses gave way to screen and lichen. The few streams which we saw were frozen over from the cold night before. When we reached Anderson Pass, we cached our packs, took a brief rest, and then began the 800 ft. climb to the summit of Kings. There were a few clouds, but nothing of concern as we scrambled over the pile of boulders which comprises the tallest point in Utah. Up until this point, we had both had pretty good health, however, about 15 minutes from Anderson Pass, I discovered I had pulled a groin muscle, and couldn't lift my right leg more than a couple of inches. I had to climb with my left, and then haul my right leg up in succession. This, combined with the ever increasing altitude, made for a pretty slow ascent. We did eventually make it though: we summited Kings Peak! As I gazed around, I saw several peaks which appeared to be just as high, if not higher than where we currently were, especially one a little to the south. However, the GPS said we were at the correct coordinates, and we weren't (or at least I wasn't) about to go traipsing off any farther. We convinced ourselves we had indeed made our goal, and after giving congratulations and taking pictures, we began the reverse process of climbing down the rock field. Upon our arrival at Anderson Pass, I was completely gassed. It was shortly past noon, so we stopped and ate lunch. There were more clouds rolling in, nothing to be concerned about, but if we had seen them when we had first started for the day, we probably would not have made our summit attempt. After finishing lunch, we made the descent down into the gorgeous Yellowstone Basin. From the pass to the Basin is a pretty shear wall, with the trail winding along the side of the cliff before switching back onto the valley floor. When we got to Yellowstone Creek, we filled up our water, and continued a short distance before turning northwest and starting our climb up to the last pass of the day and the final one of our trip. This trail was even less steep than others of the day, but the wind had picked up, along with a few snow flurries. That, combined with our mounting fatigue of the day, made the push to the pass a little difficult. Once we were over, and once we found the trail again, we started moving at a very good clip. Everything was downhill, and every step we took that night would be one less step we would have to take the next day, which helped motivate us all the more. When we finally made camp near the East Smiths Fork, we had traveled almost 15 miles that day. By this time, we had the art of setting up camp down pat, and in little over an hour, had pitched the tent, cooked our meal, done our dishes, and were ready for bed. However, we both decided to wait up for a bit to see the stars make their appearance. Even with a full moon, we were able to see them better than through the typical valley haze. We retired, thoroughly worn out, but knowing we had accomplished our goal. When Chris and I woke up Saturday morning, we wasted no time in getting breakfast made and camp broke. The morning was still pretty cold, but after thawing our water and packing up, we were ready to go. By this point, we were eating just about everything to could to help make our packs lighter. From studying the maps the night before, we estimated that we had between 8 and 10 miles to go until we got back to the car. This turned out to be just about right, as we made the 9 miles back to the car in just over 3 hours. The cans of peaches we had stashed in the car helped motivate us, and I was looking forward to the prospect of changing out of my hiking boots. After changing shoes and eating a bit for lunch, we started the drive home. The weather was great, and we enjoyed the scenery which had been dark and rainy when we arrived. Because we had made such good time getting back to the car, we decided to take the scenic Mirror Lake Highway back through the west end of the Uintas, instead of the interstate. It was worth it, the road climbed up almost to timberline, and we got to enjoy a few more minutes in the mountains. Because of the cooler weather, the leaves had started to change colors at some of the higher altitudes. Overall, I would say that this trip, is one of the best that I have been on to date. We experienced everything anybody could want from a backpacking trip, including the chance to climb the highest peak in the state. The trip did help quench the adventure flame for awhile, just in time for school to start, but I have a feeling that this isn't my last time in these mountains. (C) 2004 Hyrum K. Wright. This document may be freely distributed without modification, so long as this notice remains attached. These reports are not meant to be a replacement for map, compass, GPS, and/or other proper equipment and experience. Check local conditions before attempting any climb.